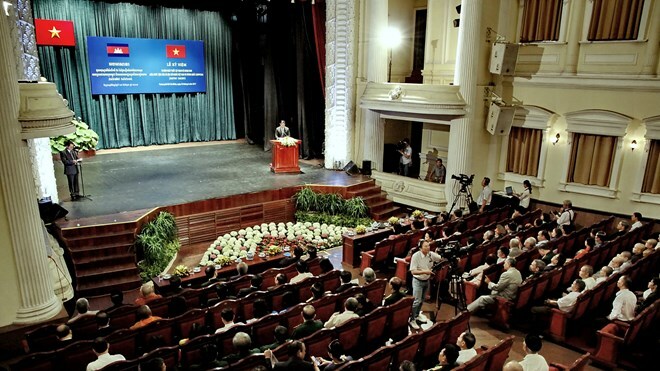 The People’s Committee of Ho Chi Minh City held a ceremony to celebrate the 50th founding anniversary of Vietnam-Cambodia diplomatic relations on June 29. Addressing the event, Chairman of the municipal People’s Committee Nguyen Thanh Phong said braving ups and downs over the last five decades, the two countries’ friendship has become a priceless asset. Bilateral cooperation has been lifted to a new level under the motto “good neighbourliness, traditional friendship, comprehensive cooperation and long-term sustainability”, reeling in a number of achievements in all aspects. As an economic, cultural and scientific-technological centre in Vietnam, HCM City has made efforts to realise the two countries’ policies, thus greatly contributing to bilateral ties through cooperation activities with Cambodian localities, particularly the capital city of Phnom Penh, he said. The city’s administration and people pledge to actively work to reinforce and develop the time-tested friendship and all-round cooperation between the two countries’ Governments and people, thereby contributing to stability, peace, cooperation and development in the region and the world, he added. Phong expressed his belief that on the basis of the two sides’ long-standing friendship and non-stop efforts, relations between Vietnam and Cambodia, as well as between HCM City and Phnom Penh, will bring about even greater attainments in the time ahead. Consul General of Cambodia to HCM City Im Heng said the traditional friendship, built and nurtured by late King Norodom Sihanouk, Vietnamese leaders and the two countries’ people, has been growing in all spheres. He affirmed that the Cambodian people never forget the assistance of Vietnam’s Party, State, army and people in overthrowing the Pol Pot genocidal regime and building the country since the 80s. He added he believes bilateral relations will continue developing sustainably in the time ahead. Also on June 29, a photo exhibition was opened on Nguyen Hue walking street in District 1 of HCM City, featuring 95 photos on the Vietnam-Cambodia friendship, solidarity and cooperation, along with the country and people of Cambodia./.